Hugh Dennis is a team captain on BBC 2's hit topical panel show 'Mock the Week' - having appeared on every episode. He also writes/presents Radio 4's award winning comedy ' The Now Show' and stars in the BBC sit-com 'Outnumbered'. In 2011 he became the host of new comedy-improv sketch show 'Fast & Loose'. Hugh was a member of the Cambridge Footlights, but after university worked as a brand manager for Unilever for six years. However, with Steve Punt, whom he met at university, Hugh continued performing comedy at venues including London's Comedy Store. At University College School he played rugby with Will Self. While in his final year of university he was approached by a member of the intelligence services and was invited to London for interview at which time he decided he did not want to take the matter further. He often makes jokes or references to his days as a 'spy'. While establishing himself on the comedy scene, Hugh turned a natural flair for impressions to better use and got a job providing the voices for Spitting Image. From this Hugh became a regular guest on the Jasper Carott Show and in 1985, along with Steve Punt, formed half of The Mary Whitehouse Experience on BBC Radio 1, later graduating to a television series. His radio work with Punt includes over a decade of performing Punt and Dennis, It's Been a Bad Week and The Now Show and a current run of writing The Party Line (a topical political satire that is written and performed the day prior to transmission). On The Now Show he is in a line-up including Punt, Mitch Benn, Laura Shavin, Jon Holmes and Marcus Brigstocke. 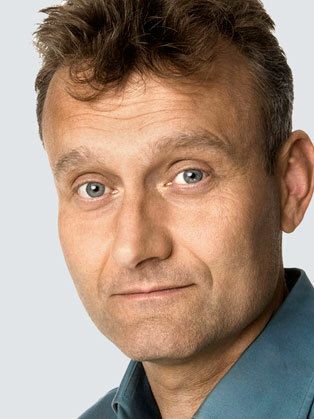 Hugh Dennis has performed on various TV and radio shows, including the aforementioned Mock the Week, The Imaginatively Titled Punt and Dennis Show, New Tricks in the episode 'Fresh Start', Outnumbered and sitcom Me, You and Him. He has guest hosted Have I Got News For You and played obnoxious GP Piers Crispin in BBC sitcom My Hero. He is friends with Chris Morris and has had cameos on Brass Eye. He has also done the narration for the CBBC show Sam and Mark's Guide To Dodging Disasters. Hugh took part in the 2007 L'Étape du Tour, cycling an open stage of the Tour de France for amateurs which was held in the mountains 2 weeks before the main event. This was discussed in the fifth series of Mock the Week and also QI series six, episode 5 'France'. He started in 2,400th place of 8,000 entrants, finishing in 3,400th from 4,000 who completed it, 5 hours behind the winner! Since August 2007, Hugh Dennis has starred in the BBC comedy Outnumbered, a semi-improvised sitcom based around family life. In December 2009, Dennis joined Oz Clarke in presenting the 60 minute Christmas special Oz and Hugh Drink to Christmas broadcast on BBC Two, and in December 2010 the pair returned for a four-part series called Oz and Hugh Raise the Bar, which puts them in a competition to create a bar featuring only local British food and drinks.